Glamorgan's bowlers struggled for wickets as their game against Cardiff MCCU ended in a tame draw following a first-day washout. The students finished on 166-1 with David Lloyd taking the only wicket. Glamorgan squad member Jeremy Lawlor made 77 for Cardiff MCCU while Bradley Scriven scored a career-best 67 not out. 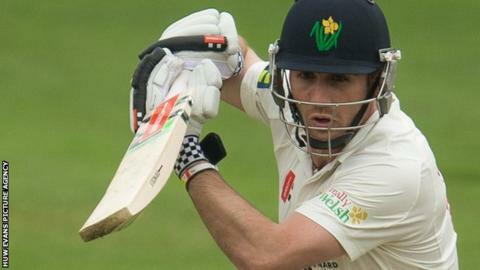 Glamorgan declared their first innings on 533-7, after Mark Wallace and Craig Meschede hit quick unbeaten fifties. "One of the main reasons we declared a bit late was to get all our batters some quality time in the middle, and from one down to Wally [Wallace] at nine everyone had good time at the middle," Glamorgan captain Jacques Rudolph told BBC Wales Sport. "From a bowling point of view the wickets column doesn't stack up the way we would have liked but the areas we bowled were more important, we were close to getting it spot on and they batted well. "It looks like the wickets [in Cardiff] are a bit better this year and it might take more hard work for our bowlers. "But if we want to play first division cricket, these are the type of wickets we've got to play on." Glamorgan start their first Championship game against Leicestershire on Sunday, 17 April.